Two years ago, I sat on the Concordia shuttle bus next to my younger sister, who was a first year student. She was new to Montreal and to the big city life. At one point during our conversation, I told her to pause and count how many different languages she was able to hear. Together we counted four: Persian, French, English and Chinese. As two Muslim girls, from a small Middle Eastern country, we couldn’t help but admire the diversity around us and how beautiful it was. 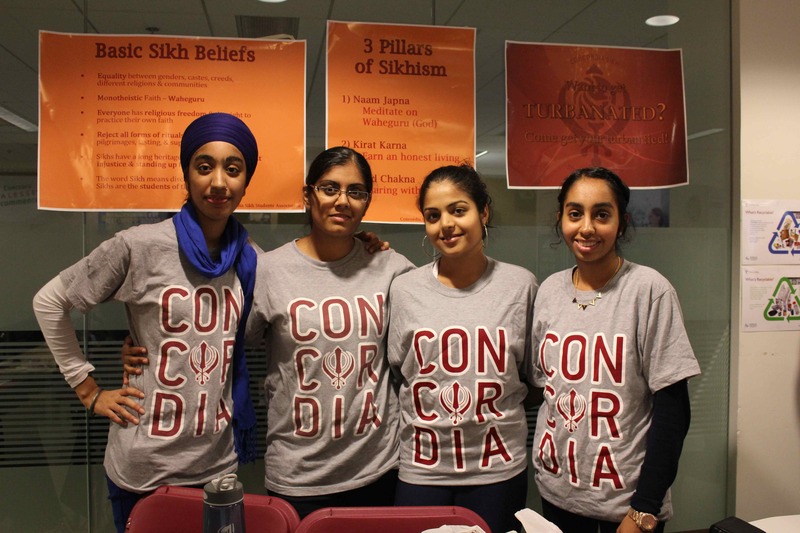 Concordia’s Sikh Student Association members Amritpal Kaur, Navjot Kaur, Amrit Kaur, Tanvir Kaur are pictured at the CSU 2013 Club’s Fair. Photo by Casandra De Masi. On Friday, Sept. 6, Quebec Premier Pauline Marois was quoted in the Globe and Mail criticizing multiculturalism and suggesting it as a possible cause of terrorism. “In England, they get into fights and throw bombs at one another because of multiculturalism and people get lost in that type of a society,” she said, disregarding Canada’s longstanding history of diversity and Quebec’s vibrant immigrant population. Terrorism, as defined by the Merriam Webster Online dictionary, is “ the use of violent acts to frighten the people in an area as a way of trying to achieve a political goal.” Its causes can vary from human rights abuse, to poverty and religious extremism. However multiculturalism has not been a proven cause. On the contrary, minority oppression can lead to violence. In the case of Sri-Lanka, the Tamil Tigers, who fought for an independent land, were classified as a terrorist organization. However, the Tamils were also a minority facing discrimination by the government. This past week, the controversial proposed Charter of Values was unveiled, along with a photo of suggested rules by the Quebec government. The charter calls for a ban on religious clothing by public employees. The picture that was released shows earrings with a crescent moon, a small cross and a Star of David ring as acceptable wear. On the other hand, the hijab, kippah, turban, niqab and the big cross, are all things to be banned. This proposal, coupled with Premier Marois’ comment, sends a message that there is some target set of values we are not adhering to. Therefore, we should leave the symbols that represent our beliefs at home, even though they harm no one. Attempting to squash different beliefs and stifle the fundamental human right to express them pulls us all back into a dark age ideology that led to massacres of thousands of people from different cultural backgrounds. The more we stifle people’s individuality, the more racial tensions can emerge. Racism also led to countless wars from Rwanda, to Sarajevo and current day Iraq. This is why it is important to stop the government from spreading the message that to wear religious symbols in the workplace is harmful. The late Palestinian theorist and founder of post colonial thought, Edward Said, argued in his 1978 book, Orientalism, that orientalism is to examine other cultures with an inferior eye when comparing them to the Western way of life. This is clearly a practice that still exists. A modern example is believing that a multicultural society causes trouble. Suggesting that wearing a hijab or a kippah can affect our work environment pours oil into the fire of racism that is still reeling from the effects of 9/11, 12 years later. Rather than ignore the effects of globalization and the changing face of our society, we should embrace the change. The positive effects of this is a widespread sharing of ideas and knowledge. Studying in Montreal, I am able to interact with people from around the world. My friends, who have different backgrounds, such as French, Vietnamese, American and Canadian, taught me a lot about their beliefs, history, life and opinions. My identity is the same, but I am better off having known them. Exposure to diversity helped me grow as a journalist, student and human. If only people who were more keen on turning it into an ‘us’ versus ‘them’ world would stop trying to shove that mentality down our throats, because that mentality is the root cause of true harm.